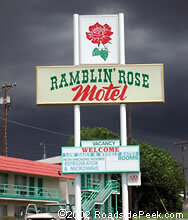 Another Route 66 motel, the Ramblin' Rose Motel along Andy Devine in Kingman still looks like an inviting roadside stop. 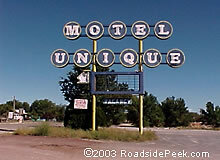 This marquee for the Motel Unique in Seligman sat off of the Mother Road. The motel closed down in 1991. The sign is now gone. 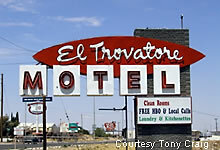 The El Trovatore Motel in Kingman is another of the Route 66 motels that feature a nice marquee off the roadside. The 100 foot tall tower sign can be seen from a distance, especially at night when the El Trovatore green and red neon lettering flashes on and off. The El Trovatore was built in 1939 and was known by a slightly different name as the El Trovatore Court. 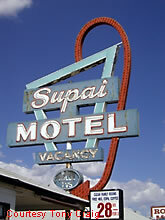 The motel and signs were paintakenly restored in 2012. The walls around the motel were painted with really cool graphics. 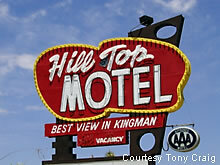 How about this sign for the Hill Top Motel in Kingman. The motel was built in 1954. The sign itseflf was repainted in 2009. This is the motel made infamous by housing Timothy McVeigh. 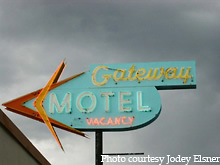 Here's a shot of the Gateway Motel off the main drag in Williams, AZ. 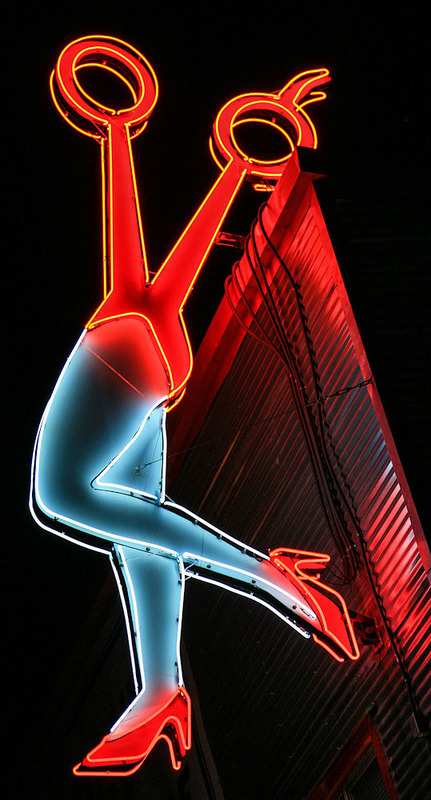 The motel opened in 1936 and the double boomerang styled sign dates back to the 50's or 60's. UPDATE 01/09 : The Gateway Motel is now the Gateway Plaza, transformed from the motel just before 2010. 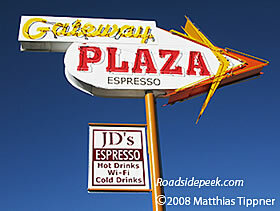 The old motel office has been transformed into a coffee shop called JD's Espresso and Internet Cafe.